Eliminates, not masks, even old, impregnated animal odors from kennels, cages, runs, walls and other large areas. Remove cap from the small, graduated part of the bottle. Squeeze large part of bottle, with cap on, forcing K.O.E. into the measurement chamber. • Add 1/4 oz. to 1 gallon of cleaning solution or rinse water. Same dilution in water may be applied using a plastic lawn/garden type pump-up sprayer. 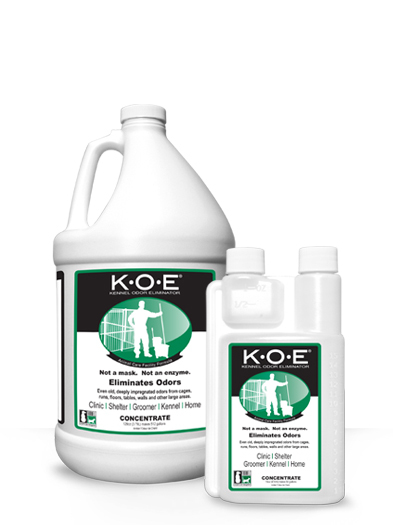 • For high pressure wash add to detergent tank at the ratio of 1/2 oz. to 6 gal. (1 to 1536). • Ratios may be varied to suit the needs of the situation or pressure equipment. Effectiveness decreased when using with Chlorine solutions.